To target 10 million farmers practicing climate-smart agriculture in the next five to seven years. El Niño may have passed, but food security in southern Africa will continue to deteriorate until next year, as farmers struggle to find the resources to rebuild their livelihoods. Currently, around 30 million people in southern Africa require food aid, expected to rise to 50 million people by the end of February 2017. 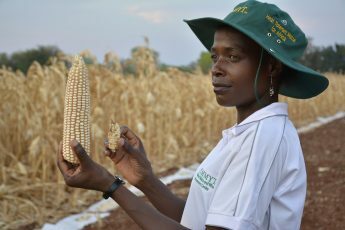 Two Zimbabwe-based scientists from the International Maize and Wheat Improvement Center (CIMMYT) highlighted predictions that El Niño will become more frequent and severe under climate change, and that heat stress will reduce maize yields in southern Africa by 2050. Research centers, development agencies and governments must work together to respond to climate predictions before food crises develop, they said.